ENAME Abbey Ham ® is a long-dried first-rate ham, which can be traced back to the St. Salvator abbey in Ename. This ham’s top quality starts with the right choice of ingredient. Even the Benedictine monks already knew that at the time. They let the pigs run free in the monastery gardens of the Abbey and thus cultivated pigs with the best gammons. Ename Abbey Hams are prepared in the beautiful Flemish Ardennes where they result in the perfect final product after a slight saltdown and a long period of maturing. ENAME Abbey Hams are cured for a long period of 9 to 12 months, depending on their weight. The hams are dry-salted and cured on the bone, which is quite favourable for the taste. After this curing period they get deboned and moulded in the specific Ename mould in order to serve you nice cut of Ename Abbey Ham. 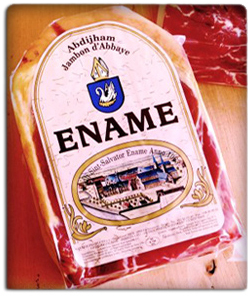 Ask your fine food store and enjoy ENAME Abbey Ham ® on every dish.